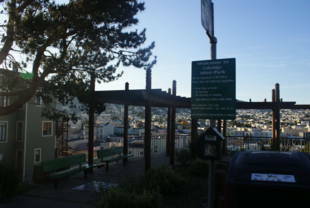 An open area situated along Coleridge Street, between Virginia Avenue and Fair Street in Bernal Heights. 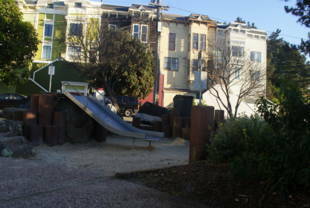 There are benches and two sand pits (one has a slide). 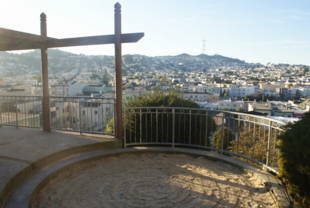 Coleridge Mini Park also has sweeping views of the City to the west and north. 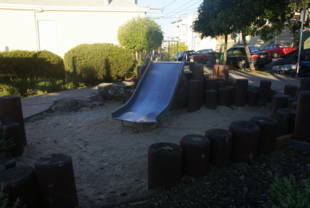 Coleridge Mini Park is owned by the San Francisco Recreation and Park Department. 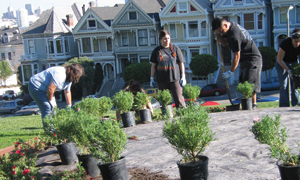 14-Mission, 36-Teresita and 49-Van Ness/Mission inbound routes -- offboard at Mission St. and Fair Ave. Walk east on Fair (it's a bit uphill) two short blocks to Coleridge, then make a right and head south on Coleridge to the park. 14-Mission, 36-Teresita and 49-Van Ness/Mission outbound routes -- offboard at Mission and Valencia Streets, backtrack along Mission to Valencia, cross Mission and onto Fair Ave. Walk east on Fair (it's a bit uphill) two short blocks to Coleridge, then make a right and head south on Coleridge to the park.